Social Patterns is the premier SEO company in Sacramento, CA. We are a group of SEO professionals that get the job done. We not only use it in our online businesses, but we also help our clients’ search engine rankings and traffic soar. We have been in the SEO industry long enough to know what works, what doesn’t, and what strategies need to be changed. We read about search engine optimization on a daily basis, and we are very active in the SEO community. Rest assured that we will implement the most up to date, and white hat strategies to offer your business the chance to experience massive growth for the long term. So what is SEO exactly, and how does SEO work? Well, to put a complicated answer into simple terms – Search engine optimization or SEO is a set of techniques or strategies that are implemented to increase your website’s rankings on Google and other major search engines. In short, SEO implements strategies to increase your business’s traffic, rankings and revenues. It doesn’t matter whether your business is a brick and mortar location, or an entirely online based business. SEO will help drive the overall growth of your company. For example, say you are a local carpet cleaning company based in Sacramento. You would want to rank high for the terms carpet cleaning when people in your city type in that search phrase into Google. You may also want to rank for Sacramento carpet cleaning for example. Another example would be an entirely online based e-commerce store that sells pet products. They may want to rank high for keywords like dog leashes, or best dog leashes. It doesn’t matter what you sell, or whether you sell anything online at all. With SEO, you will have a very high ROI marketing channel fueling the growth of your business. There are varying definitions of what the word SEO is. Here at Social Patterns, we tend to see SEO as a broad overarching term that covers a variety of different techniques and practices that aim to improve your search engine rankings, in a moral and productive manner. There are many search engine optimization strategies that can be implemented to increase traffic and rankings. 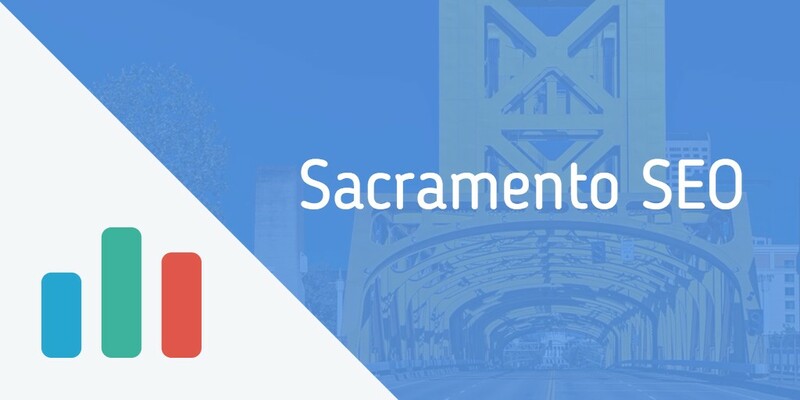 Let the Sacramento based Social Patterns guide your business into using the best and most up to date SEO strategies, that will lay the groundwork for massive future growth. We can help in many ways, such as doing effective keyword research, writing the SEO optimized content, building a good website architecture, internal linking, implementing sitemaps, building white hat links, optimizing your pages based on the best keywords, etc. We go above and beyond the typical Sacramento SEO strategies. At Social Patterns we are always staying up to date on the SEO best practices so that we can implement the best of the best SEO strategies that prove to deliver long-term growth. Years ago SEO was a pretty narrowly focused practice. However, in 2016 and beyond, SEO has turned into a vastly expansive set of strategies, techniques, technologies, and an overall mindset. SEO encompasses many other marketing channels, such as Social Media, Content Marketing, SEM, Public Relations etc. For example, SEO affects how you write your content for your blog, your social media campaigns, your website development, your website architecture, etc. SEO has come a long way, and it has turned into a much more extensive field that touches on many many aspects. Not only that, but SEO is incredibly important for your company’s success, especially considering there is a risk that you are punished by the major search engines like Google if you do something wrong. For example, there are cases where an SEO company takes shortcuts to try to get better rankings for the short term to please the clients, only to find out later that Google penalized and banned the website from their search engine index; demolishing their business. In short, you should not trust anyone who has not been in the SEO industry for an extended period, nor should you trust any SEO companies that take shortcuts. You should educate yourself enough to know what questions to ask, so you know that you are dealing with an SEO company that has your best interests at heart. Traditional mass advertising like TV commercials, radio and billboards are becoming less and less relevant. Firstly, they are usually reserved for companies with deep pockets. Secondly, people have been conditioned to ignore most advertising messages because we are inundated with them on a daily basis. Many businesses are waking up to a stark reality, that many of us marketing geeks have known for a while – it’s that SEO isn’t a luxury anymore, it is an absolute necessity. Until the day that people don’t use search engines as a hub to find information, products, and businesses, search engine optimization will continue to remain crucial in any marketing strategy. However, the use of search engines has steadily grown over the years, with no end in sight. This means potential customers are using search engines as a tool to find businesses like you. If you fail to get your business high up on the search engine results page (SERPS), you may have a tough time getting customers. The online competition is also more and more fierce as time goes on. If you think about it, the internet is still relatively new in the scope of humanities history. The point is that at this state of the online world, competition is fierce. One day you could easily dominate in a niche sector, however now you will be fighting over hundreds of other companies vying for the same Google rankings. That brings us to the next point. In the search engine world, if you aren’t in the top 3 positions for your keywords, you might as well not be indexed by Google at all. The top result on Google for any given keyword gets the lion’s share of traffic, with some of the share going to the few results below the top. SEO is the way that business stands out in a noisy online world. SEO allows people to seek YOU out, rather than trying to interrupt your customers. With SEO, you are not only found by customers, but they come and seek you out. SEO is the answer to a highly competitive online world. The only difference is who has the better SEO. If you allow our team at Social Patterns to conduct your SEO campaign, we assure that you will have the best SEO in your niche. The statistics for the rate of business failures is extremely high. The reality is that most of the companies that fail due to a lack of marketing or the wrong type of marketing. Those businesses that do marketing the right way (by doing internet marketing and focusing on search engines), don’t become just another statistic. They are the outliers that get the lion’s share of the customers. This makes sense in the face of another fact of consumer behavior; consumers use search engines to find products, services, and businesses. Most people also only visit the top 1, 2 or 3 organic listings of the search engine. In the face of this reality, it makes you realize how incredibly powerful SEO can have for your business. How can you become another failed business statistic if you are dominating search engine rankings and traffic in your field? It’s just not very likely when you are getting the lion’s share of customers and potential customers. Gone are the days of traditional advertising like print, radio, and billboards. Today’s smart businesses know that they must remain savvy, especially when it comes to their SEO efforts. Let our team in Sacramento, ca do the SEO hard lifting. Our team of SEO experts will know exactly what it will take to take your business and your search engine rankings to the next level. SEO is like politics. Each SEO has different beliefs about what works best, and the underlying philosophy that carries their SEO tasks. For this reason there is a big debate between White Hat Vs Black Hat SEO philosophies and practices. Since SEO is such a delicate field, any mistake can lead to detrimental effects to our client’s websites, which in turn would be damaging to our company. Our reputation depends on the quality of SEO work we implement. That is why we want to be certain that we only apply good white hat strategies that will last for the long-term. You shouldn’t get stuck in the trap of hiring a flawed SEO agency that only does short-term traffic building strategies. What may work in the short-term often does not work in long-term. Any company or person that tells you that they guarantee number one rankings or number one rankings very quickly, especially for a competitive term, is probably using blackout strategies. You want to stay far away from these companies. Sure, they may deliver some quick results in the short term, until, of course, Google catches on and penalizes your site. Using these strategies to trick the search engines can hurt your business, and it risks your online reputation. Ultimately it may impact your future search engine rankings negatively, which can be detrimental to your business’s revenue. Often if you are not a big company already, Google is not so forgiving of any black hat SEO techniques. There was a story where JC Penny hired the wrong SEO company, and their online rankings were eventually demolished when Google say the manipulative black hat SEO techniques. However, lucky for them they were a large corporation, and Google seems to be more forgiving to large corporations. They were able to reverse the black hat strategies, and their rankings stabilized. However, if you aren’t a multi-million dollar household name, Google may not be so forgiving. Google may permanently brand your domain as a spammy domain. You might have to get an entirely new domain if the so-called SEO “experts” did enough damage to your website, attempting to give you quick results. The moral of the story is, Google is smart. They are one of the biggest companies on the planet, and they hire many of the smartest people on the planet. One SEO agency or any individual is going to have a hard time tricking Google for the long term. Our advice to you is doing your due diligence when hiring an SEO firm to handle the SEO campaign of your company. Otherwise, you may get stuck with the wrong company that could do more harm than good. Here at social patterns, we offer our clients a long-term white hat SEO and marketing campaign that deliver consistent revenue and traffic over the long term. To do this, the first thing we do is analyze your website and do an SEO audit. Then we will take a look at your business model and website to get a better understanding of your business and industry. After that, and only after that, we can we create a custom SEO campaign for your business. That’s what separates the good SEO companies from the bad ones. It’s the ones that build the right team who are willing to do the labor intensive groundwork for an honest, moral SEO campaign that isn’t manipulative in Google’s eyes. This is the best long term strategy. The best SEO companies are also the ones that are willing to lose a couple of clients here there that don’t understand the long-term nature of SEO in general. That’s the SEO company you want. Otherwise, you may choose the wrong one that will be in the habit of trying to please you in the short run, so that they can keep their client retention higher in the near future. This is the single biggest mistake I see other SEO companies doing, and the single biggest mistake I see business owners falling prey to. Either the SEO companies don’t know what they are doing, or they are trying to please clients by delivering quick results in the short term. Often the only way to offer great short-term results is to implement black hat strategies, which sometimes, I’ll admit do produce results in the short-term. However, you must be warned; these strategies are very, very risky. You are risking your ENTIRE business with the wrong strategies. All our strategies and techniques at Social Patterns are based on completely white hat strategies. We do this because we have your best interest at heart as we know this is the best way to long-term success and word of mouth. We cannot survive as a long-term business only implementing short-term blackout strategies (like many SEO companies seem to do). That’s why we have dedicated ourselves to implementing only white hat strategies and continually educating ourselves and our team members on the most up to date white hat SEO best practices and strategies. Research: The first stage in creating an awesome SEO strategy is to do the initial research. This initial research period takes into account everything from analyzing your business, your industry, keyword research, and competitive analysis. Proper research, especially dealing with keywords, helps produce a road map for creating the homepage, internal pages, future blog posts, product descriptions, social media strategy, etc. Analytics & Setting Goals: SEO is all about setting goals and then implementing the best-known strategies to achieve these aims. Then it takes analyzing the results and pivoting if anything needs changing. Just like any online marketing strategy, SEO involves a lot of testing and measuring. It is crucial to measure the progress to maximize your site’s traffic and revenue. Google Analytics is amazing for this purpose. It provides very useful information we can use about your traffic to maximize traffic, sales, and any other conversion (like calling a number, entering email, etc.). With Google analytics, we can fix any apparent issues, pinpoint the best keywords to focus more content efforts on, set and track goals, track micro conversions, see demographics of customers, and generate reports. Content Strategy & Development: In today’s competitive online world, content marketing and quality content creation are at the heart of any good SEO campaign. A good content strategy allows us to create many pages, blog posts and articles that target potential customers. Content is also incredibly beneficial for attracting and earning backlinks, which are powerful ranking influencers. Any great SEO campaign includes data-driven keyword research with quality content marketing. On-Page Optimization: What use is all that great content, if the Google search engine bots cannot analyze and read each page? There are many things that we do to optimize each and every page, blog post, article, etc. so that Google can index it effectively and so that it shows relevancy for each keyword we target. Link Building and Social Signals: Links pointing to your website from third party websites are called backlinks. These, along with social shares of your content are signals to Google that your content is popular online, and is thus relevant and important to any given set of keyword phrases. However, the difficult part about links is they are just that – difficult to get naturally. Also, if you build links without earning links, it is considered manipulative in Google’s eyes. Therefore, link building is a delicate process. As an SEO, we have to be careful to seek link building opportunities that are white hat, and natural. Two ways we can do that is by doing a lot of outreach (relationship building with other website owners), and content marketing. The link building process is where most SEO companies screw it up. They implement black hat or manipulative link building practices; that frankly are old school. These do not work any longer because Google is very sophisticated. At Social Patterns we implement only white hat, natural link building. We do this because it is the only link building practice that is safe, powerful, and stable over the long run for your business. Reporting and Analysis: Reporting on the SEO campaign is important because it keeps our clients in the loop on what is happening with their business. It is important to measure the ranking position, and more importantly how much (quality) traffic you are gaining. Though #1 rankings are important, you shouldn’t be stuck on that metric. That is a somewhat old school metric in the SEO world. The new metrics would include things like the amount of keywords, traffic and the amount of quality traffic (traffic that converts). The old way of thinking, regarding being #1 for a particular term is sometimes referred to as “ego metrics” in the SEO industry. The reason is that often, the client is only focused on that one aspect. While we also concentrate on that metric, it’s not the entire story for achieving your end goal, which is typically maximizing revenues.